This dual-LED reading light can clip to any object up to an inch thick. 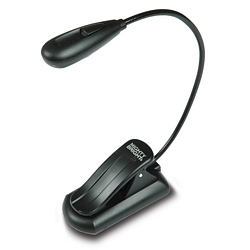 The flexible neck holds its shape so you can position the light right where you want it. The three included AAA batteries provide hours of efficient light. Use it with books, laptops, PDAs and more. Includes 3 AAA batteries.